I’m home at last. What a long train journey it was! I’ve walked about 212 miles, but haven’t yet attempted to work out the ascents and all that stuff. It was great fun. The washing’s in the machine, the tent is drying in the garden, the cat has been fed and tomorrow I’ll go and collect wee Piglet. How fast it all went. This entry was posted on Friday, May 28th, 2010 at 6:11 pm and is filed under TGO Challenge. You can follow any responses to this entry through the RSS 2.0 feed. You can leave a response, or trackback from your own site. 15 Responses to Home again! Well done on the 212 miles. Look forward to the full report. Welcome Home! I managed 5 days and then Big Nasty Gremlins appeared and I had to rush to Yorkshire….where I still am! I was looking forward to catching up with you but it was not to be……. Congratulations Shirl. Even more congratulations are due if you managed to get all of that fish down your gullet! I managed all the fish but only a bit of the (ultra-yummy) batter, and just a few of the chips. Phew! Congratulations Shirl. Look forward to hearing your podcasts and reading your report. That’s a mighty fish supper there! 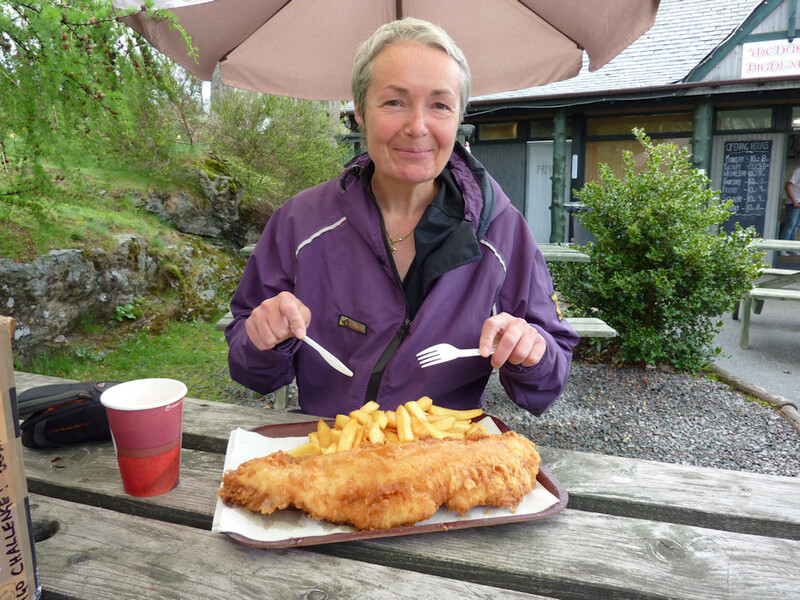 Wow Shirley – that’s a fish and a half! How did you get on with your TZ7? I’ve got one and think it a good compact – better than my Canon IXUS 980 I’d say, although not as much manual control. I absolutely *loved* the TZ7. What a thrill the extra wide lens was! Nor was the battery life as awful as I’d expected it to be, though I did take two spares and recharge all of them in Braemar. I’ve not got to grips with the cunning things it can do off the auto setting yet, but really it was the lens–both the width and the quality of it–that blew me away. I can’t recommend it more highly. Oops re: the fish supper, btw *g* You lot have some strange linguistic conventions up there! btw, it would still be a ‘fish supper’ up here, no matter when you ate it! Well done Shirley! Really looking forward to the write up, your’s is always entertaining and a darn good read. Sure Piglet will be pleased to see you. That’s not a fish, it’s a whale! And you’re right–it was certainly a whale!